The couple out of Texas said their dog, Winnie, died while in the care of a dog walker they hired through the popular app. HOUSTON, Texas -- A couple in Texas said their beloved dog died while in the care of a dog walker, and the Wag! app tried to cover it up. 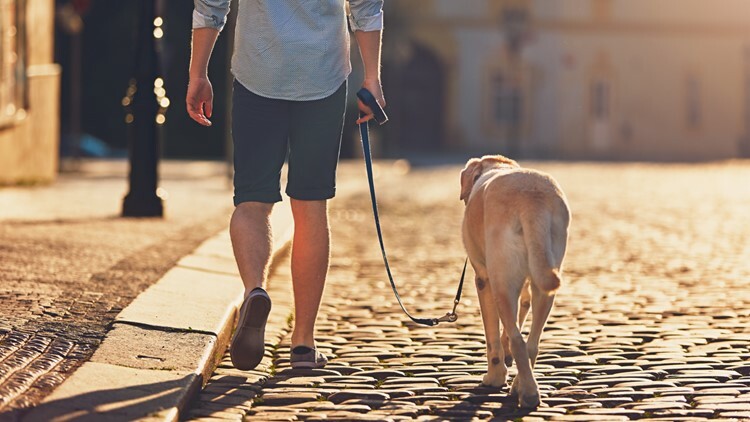 CBS said Sara and Nick Moore of Houston used the so-called "Uber for dog-walking app" to hire a walker to stay in their home and care for their dog, Winnie, during a 10-day vacation. Sara was skeptical of the walker the day she and Nick hired her, CBS said. She then grew concerned when she didn't see the standard confirmation that the walk had ended. Later, over the phone, the walker told Sara that Winnie was safe. But shortly after, Sara got a call from a Wag! representative, who said Winnie had been hit by a car and did not survive, CBS reported. After the couple rushed home, they learned Winnie had been taken to a local pet hospital but didn't know who had taken her there. CBS said the representative told the couple the company would pay for cremation expenses and open an investigation, but Sara and Nick never got any answers on what had happened. Later, Wag! sent the Moore family a settlement and non-disclosure agreement saying if they wanted the company to pay for the cremation and memorial paw print, the couple would have to sign the agreement that they wouldn't say anything about the incident. CBS said the Moore's declined to sign. Wag! reached out a couple more times following the Moore's Facebook post that went viral about a month after Winnie died, CBS reported. A Wag! spokesperson told CBS News the company extends its sympathy to the Moores. "We're a company of dog lovers and pet parents, and we're deeply saddened about what happened to Winnie," a corporate statement to CBS News said. "The hit-and-run accident involving Winnie was an unusual accident, and we provided the Moores with updates as we investigated what happened. We're addressing concerns about our response procedures, and we're changing our policy for paying claims to reflect a higher level of sensitivity to each situation. We care very deeply about the health and safety of the dogs walked on our platform. We use a robust vetting process that includes an application and verification process, a third-party background check, and online tests covering dog safety and handling knowledge that each applicant must pass to be approved to work on our platform."